There are a lot of motivational manifesting quotes, but which ones also teach you how to apply the Law of Attraction? 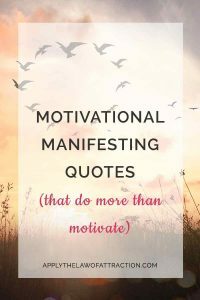 …but many quotes about manifesting don't help you refine your application of the Law of Attraction or teach you new techniques. First, pretend once you just break the ice, someone else will be taking over to finish the job for you. Now, this I have used only as a spatial example. You can take it in a financial sense, take it in the social world; take it in any way whatsoever. That is what came to me a few days before I closed. For if I could find something more simple to tell them than I think I have told them, this would be it: to enter into the state and not simply think of the state. To update everyone on my situation- I had last wrote about how I had been manifesting old exes popping up into my life who suddenly wanted to be super friendly and meet up and also a really old friend I hadn’t heard from since high school, as well as the person who I am bringing back into my life’s roommate. I’m happy to report that I ran into the ex I am currently attracting a relationship with. It was absolutely unexpected! I had been practicing letting go and just saying to myself “I surrender to you, God!” every time I started to think thoughts about him that weren’t positive or were thoughts of resistance, doubt, or worry. I know that running into him, althought that was all that occured other than a friendly greeting and a hug is the first step in establishing the relationship I desire with him. I am celebrating my success that could only have come from all the guidance I received from your book, blog, and the kind and encouraging comments on my last post.